Balloons seem to have lost their appeal to most of us. They’re still just the same boring balloons we’ve had for years. Sure, those ones made into cool shapes will keep us a little more interested, but it’s still not enough. Well these Illoom Balloons bring new life to balloons. Fill a dark room with these and you’ll have some interesting child-like lighting that will keep everyone entertained. Each balloon has a tiny LED light, which makes the whole balloon glow. In order to get the balloon started you just pull the tab to activate it, then air it up. You can as usual either just blow them up and have little glowing spheres on the floor or put helium inside to give yourself some floating spheres. Surprisingly these will actually glow for a full 15 hours. They come in packs of 15, you can get a blue pack, a pink/white/purple pack and then a mixed colors one. Each pack of them will cost you £8.99 or about $14 through Firebox. Be careful – very dangerous when the balloon explodes. The light and battery become a projectile and can put out your eye. These balloons are dangerous, had one explode on member of family whilst inflating. Excruciating pain and burn. Have complained to source bought from at beginning of August and I am still waiting for a response from the company!!! Please don’t let children play with them and inflate 4ft away! These balloons are not only disappointing but they are also dangerous. I tested one in the house in the dark and it hardly glowed, they certainly don’t light up like the pictures suggest they do. 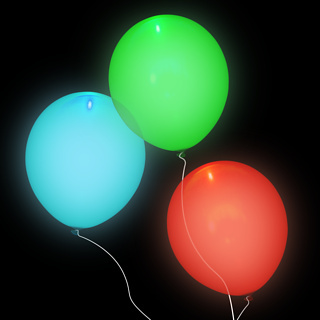 Cheap glow in the dark balloons light up better than these. The balloon also exploded which fired the LED light across the room. Just glad my son was in bed when I tested it! I certainly won’t be using them at his party which is what I bought them for, I don’t fancy being sued by an angry parent if their child gets hurt with one of these! This seems to be a common occurrence from what I have seen on other reviews.